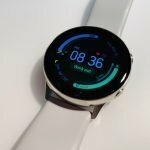 Home Reviews Fossil Sport Review – The Irresistible Wear OS Smartwatch! 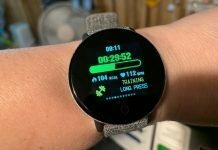 Fossil Sport Review – The Irresistible Wear OS Smartwatch! For the past few weeks I’ve been testing out the Fossil Sport. This is one of the newest Wear OS smartwatches in early 2019 and only one of two currently on the market that feature the new Snapdragon Wear 3100 chip. I’ll explain what this chip is all about in a bit but I have to admit what drew me to the Fossil Sport was, “Finally a smartwatch that has a fun stylish, yet practical design, and doesn’t wear like a brick on my wrist!” What took so long! The Fossil Sport is available in two sizes, 41 mm and 43 mm, and in 6 colors. When I saw the red one I knew it was over for me. Just like the red iPhone XR attracted me, I was completely taken by the Fossil Sport. Finally, a smartwatch that wore my colors but what was left to be determined was if it was only good for looks. I’m happy to report it has a lot going for it on the inside too. The heart rate sensor tested out very well, GPS did a great job (though I want to do more testing), and my favorite Wear OS apps like Endomondo and ViewRanger function well. It does equally as well at being a fitness watch as it does being a smartwatch. 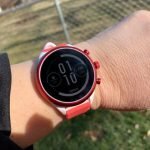 Yes, there are more capable fitness watches from Garmin, Fitbit, and others and the Apple Watch is still the best smartwatch out there (if you have an iPhone) but the Fossil Sport hits the mark well on style, functionality, and price. And let’s face it – It’s just so dang cute! Especially in red… though I might be biased since I have a thing for red. 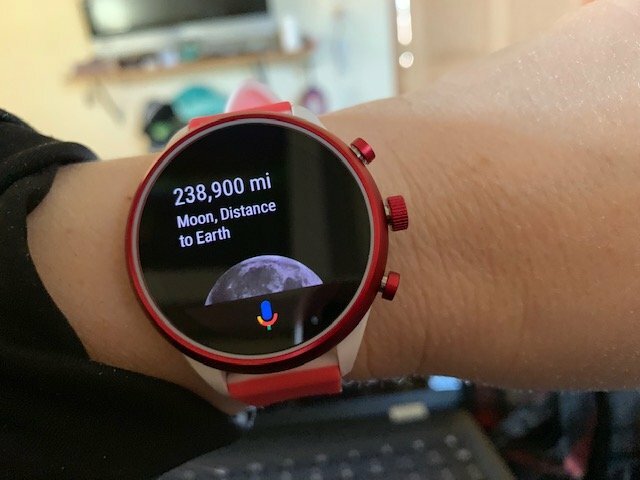 Using Google Assistant to find out how far the moon is from Earth. 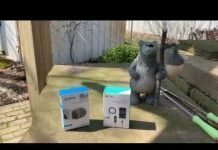 Snapdragon Wear 3100 – Does it Matter? 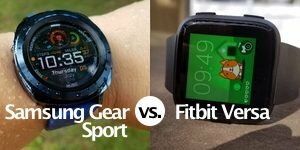 As stated earlier, the Fossil Sport has the newest Snapdragon Wear 3100 chip and while I don’t notice a tremendous difference in performance between it and the new Ticwatch S2 that is still using the old chip, the Fossil Sport is poised to get better over time. Primarily what the new chip is all about is better battery life and the Fossil Sport does have decent battery life. I first put the watch on this morning at 8 am after letting it charge to 100% and at 3:13 pm it has 79% of the battery remaining. That’s after a 20-minute workout on the treadmill too using Google Fit. The Fossil Sport’s battery has easily been getting me through the workday and more which is an improvement over the Ticwatch E. I’ll be comparing it directly against the Ticwatch S2 which I just got my hands on to see if there’s a noticeable difference. Both watches have about the same size battery but the S2 is running off of the 2100 chip. What is significant about the new chip is that the Fossil Sport has the hardware to take advantage of future Wear OS upgrades well into the future. This is a watch you probably won’t feel the need to replace for a couple years and hopefully longer. Hopefully, the new sports mode made possible by the new chip will be unleashed on the Fossil Sport. This new mode promises 15 hours of battery life while using GPS and the heart rate sensor. If true, that’s impressive. But for now compared against the Ticwatch S2, I can notice that the Fossil Sport is a little easier to work with. I’m not sure how much of that is due to possibly better hardware specs on the Fossil or the improved chip. It’s hard to say but whatever the reason, the Fossil Sport runs a little more smoothly and I find it easier to make on-screen menu selections and type on the small keyboard. The Fossil Sport runs like other newer Wear OS smartwatches. There’s not a tremendous difference but it does have features that I think make it stand out. The Fossil Sport has three buttons on the right side of the case. The top and bottom buttons are programmable in that you can specify what app you would like them to open. 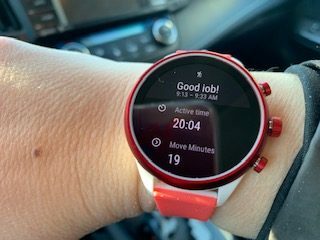 I particularly like this feature because I have the top bottom programmed to open Google Fit so I can quickly start a workout and the bottom button programmed to open the weather app. The middle button, or crown, is used to bring up the app menu and also acts as a back button. It’s also a rotating crown and enables you to scroll the screen up and down with a twist. It works very well without any lag. The Sport also has an ambient light sensor so the screen gets brighter in bright conditions and dimmer in darker conditions. In contrast, the Ticwatch S2 has 5 brightness levels that have to be manually set. The Fossil Sport also has these levels but also the ambient setting and even a “sunlight boost” setting. However, I haven’t needed to use this setting because the screen is quite readable in direct sunlight but if you need it even bright, you have the option. There’s also a battery saver setting, thank to the new chip that turns off the Wear OS software and puts the watch in a low power consumption mode. In this mode you’ll only be able to see the time on the watch. This can be a useful setting when travelling, at night, or when you just want to extend the battery life. It would be great if the watch continued to count steps in this mode like the Ticwatch Pro’s essential mode does. If it did that, I’d probably use the setting quite a bit because throughout the day I’m mostly interested in checking the time (it is a watch!) and having my steps counted (this is 2019 where steps don’t really happen unless they’re tracked). A bug I noticed is that when I put it into battery saver mode, even when there’s plenty of battery left, I have to put the watch back on the charger to get Wear OS to turn back on. Hopefully this is fixed soon because it kinda defeats the whole purpose of the mode! There’s still some lag in the Fossil Sport. Google Play Music crashed on me though most of the time it runs smoothly. And yes you can store music on the watch using Play Music and I believe some other streaming music apps that support music downloads. The Fossil Sport has a mic but not a speaker. Many have been complaining about this and I’d have to agree that I wish the Sport has a speaker but since I’ll be having it connected to an iPhone I wouldn’t be able to use the speaker for phone calls anyway. But if you have it paired with an Android smartphone, you are losing out on a handy feature that Wear OS is capable of. The new Ticwatch S2 that I’m reviewing also doesn’t have a speaker. I’m not sure why so many Wear OS watches seem to be ditching the speaker. To make room for other sensors? 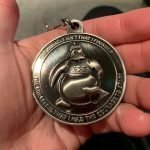 To achieve better water resistance? I’m really not sure but it would be nice to have one. The watch faces that come with the Fossil Sport are useful and attractive. Most are also customizable. You can choose what data to display and have control over colors. Of course, you can also download other watch faces from third parties. Overall, I enjoy interacting with the Fossil Sport, notifications come through reliably, it connects easily and stays connected to my ancient Samsung Galaxy S7 which I tested it on. I also received notifications reliably when paired to my iPhone XR. I just can’t reply to them like I can using an Android smartphone. 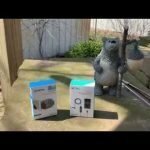 My first few tests using the heart rate sensor during a workout with the Fossil Sport were a bit disappointing. It would do great until my heart rate got above 125 bpm or so. It would go up to 150+ bpm and stay there for quite a while even though my heart rate was 20+ bpm lower. Then I read the little card that came in the box with the Sport recommending that the watch be worn a little higher on the wrist during workouts. Who reads directions unless they’re forced too? Once I did that I got terrific results. It pretty much stayed even with the Polar H10. So, if you have issues with the heart rate sensor on the Fossil Sport, try wearing the watch about an inch up from your wrist bone. 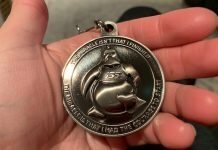 It made all the difference for me. Admittedly, I haven’t had much opportunity to test out the built-in GPS just yet. When it’s January and you live in Illinois, there’s not many chances to get outdoors and do any serious hiking or biking activities. In fact, this week is forecasted to be below zero with wind chills ranging from -20 to -40 below zero. I’m not hiking in that! As soon as above freezing weather arrives, I’ll hit the trails and update the review with more details but in my limited tests with the GPS it did a good job. 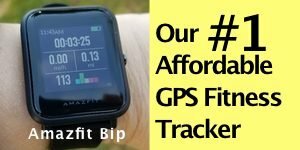 Distance estimates were on par with the Garmin Vivoactive 3 Music. When I use Google Maps, Endomondo, or other apps that utilize GPS, it is able to accurately display my location promptly. But I’m going to hold off grading the GPS until I can do real tests with it. I’ll also be testing out swimming with the Fossil Sport because it is waterproof to 50 meters. Even if you never plan to swim with the watch, I always recommend choosing a smartwatch with a 5 ATM or better rating. Watches with higher water resistance ratings simply have to be constructed and engineered better and you never know when you might accidentally submerge a watch in water. What the Fossil Sport does best as a fitness tracker is monitoring your heart rate, steps, and giving you a good picture of your physical activity throughout the day through Google Fit. Google Fit has been greatly improved and through it you can not only see how many steps you’ve taken but also your resting heart rate, heart points (how many minutes you’ve worked your heart each day to improve physical fitness), and a history of your daily trends and stats. It also has a breathing app to help calm your nerves. What is missing is sleep tracking. You can download third-party sleep tracking apps. I hope that Google Fit includes sleep tracking in the future but I haven’t heard of any plans to include this. Battery life has to be improved first and with the new chip, we’ll probably see it one day. Step tracking seems to be accurate. In my tests it’s done a good job and seems to be pretty darn good as a step tracker. It should give you a good picture of how many steps you’ve taken, although no step tracker is 100% accurate. Of course the best part of using Wear OS is that you get all those great Google apps like Google Assistant, Google Maps, Google Translate, Google Play, Google Play Music, and more. I’ve tested out Google Assistant by asking it random questions and it does a good job understanding what I am saying and finding the answer. To use Google Assistant you simply swipe the screen to the right and ask away. Using Google Maps to navigate to other locations also functions well but this is when it sure would be nice to have a speaker. Listening to music with Bluetooth headphones connected to the Fossil Sport has worked fine. The connection has been stable and the sound quality is very good. This may all depend upon what Bluetooth headphones you’re using but I haven’t had any problems. Battery drain isn’t terrible either when listening to music. After 50 minutes of playing music the watch lost 17%. I wish that were a bit better though. Overall, I am happy with the Fossil Sport. I can easily recommend it to anyone considering a Wear OS smartwatch. I love the look of it and how comfortable it is to wear. I like that there’s options in both different sizes and colors and that it can look equally as good on both men’s and women’s wrists since there are options for both size and color. You can choose a sporty fun color like I did or go more traditional and pair it with a leather strap for a more upscale look. It didn’t disappoint me in its’ fitness features either I’m going to hold off assigning a rating to the watch until I get those GPS test results. I might have to move to another state or wait until spring to do that but they’ll be coming! I’m happy with the battery life. Yes, I’d be happier with even better battery life but it lasts through the day easily. It charges quickly as well so even when you do need to charge it you don’t have to be without it for long. I’m hoping that we’ll see improvements later this year due to the new chip. It would be terrific to get 15 hours of battery life with GPS and the heart rate sensor running continuously. That would be impressive. There are some bugs but it’s hard to tell if that’s due to the watch or the apps themselves. Most of the apps I’ve tested on it function well. If you have an Android smartphone the Fossil Sport is one of the best smartwatches to choose from. It ranks up there with Samsung’s Galaxy Watch and it supports more apps than Samsung’s Tizen OS. If you have an iPhone, the fitness features will still function just as well but you’ll lost out on the ability to reply to text messages and support for some of the better Wear OS apps which stinks. 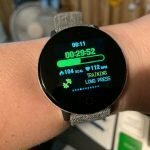 Wear OS continues to improve and it looks like the Fossil Sport is going to be one of the watches to benefit from those improvements in the future since it has the latest chip. 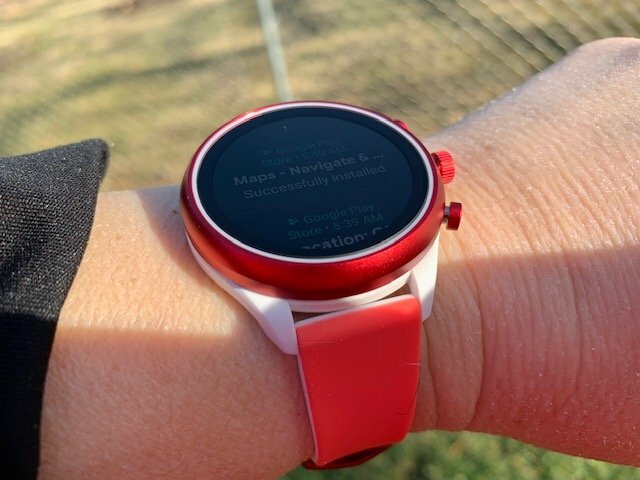 That might be the biggest reason to choose it over other Wear OS watches… That and it’s so dang cute and it’s available in red! You can order the Fossil Sport from the Fossil website. It should be coming to other to retailers soon.